It was an outrageous, thundering sound and I was holding on so as not to be blown away. It was Led Zeppelin’s first concert at the Budohkan in Tokyo, Sept. 23, 1971. The sound I was listening to was from my just-plain-lucky, impossible-to-get seat, third row center at the arena. It was more than I expected and better than I have ever heard before or after. The first sound from the drums, when John Bonham hit them to check the kit before the first song, gave me a hint of what might come for the next couple of hours. Robert Plant introduced two new songs, “Black Dog” and “Stairway to Heaven.” The songs were on their fourth album, which was released a few months after the concert. While I was listening to these two songs, I knew they were going to be classics. They donated all the profits from that Sept. 27 show to the atom bomb victims through the City of Hiroshima. They might have only been curious about the atom bomb and yet I believe we all should praise their donation of $70,000 (more like $500,000 today), and that more people should know about their quiet generosity. The first gift I gave to my first girlfriend was Led Zeppelin’s single “Whole Lotta Love.” This Japanese first press single came in a picture sleeve with a photo of Jimmy Page playing his Telecaster-like Fender guitar. In the photo, Plant stands singing and holding a Shure microphone. The song was composed based on an American blues song, “You Need Love,” written by Willie Dixon and recorded by Muddy Waters. I worked hard translating the lyrics and at that time, with my limited English ability, I had no idea the lyrics were full of hidden sexual meanings. I gave my hand-written translation of the lyrics to my girlfriend with the record. 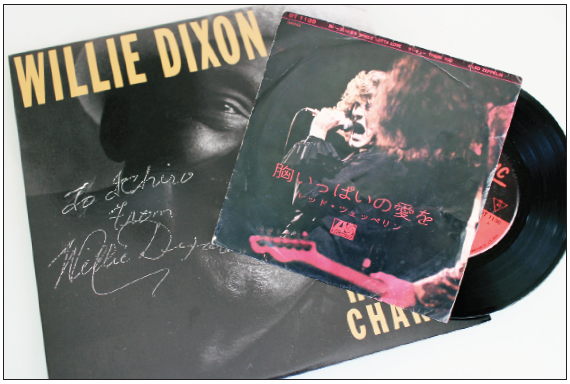 Willie Dixon autographed “Hidden Charms” LP cover and Japanese “Whole Lotta Love” 7″ single. In 1988, I met Dixon at Tower Records on Sunset, in Los Angeles. I believe he is the godfather of the blues. He wrote many of the most famous blues songs I have listened to since I was a high school kid. My wife and I, with our three-year-old son, went that day to meet Dixon. My son must have gotten a certain impact from that great artist. He remembers the day even though he was just a baby. Dixon’s music was included on Led Zeppelin’s debut album. Their second album contains the mega-hit “Whole Lotta Love.” The song is based very closely on Dixon’s “You Need Love.” It was not credited to Dixon, who later sued the band and won the case. The first press of Zeppelin’s first album, both U.K. and U.S. copies, are pretty rare. They are one of the popular items on eBay today, but very pricey. Not only is there a different sound but also the U.K. first press outer sleeve comes with the group’s name and the Atlantic Records logo in turquoise blue instead of orange. The first copies of the U.S. press outer sleeve has no differences, but the label’s colors are in purple and brown, similar to Atlantic Records’ other label, Atoco. In addition to the label colors, this early version of the LP has a different mix from the same recording, and the tone of the music is different. It’s a more vivid and lively sound. Maybe these were mistakenly pressed using the test mix and label color variations and distributed to mail-order record clubs. After some research, I believe that may be why they were not available at record stores and the number of copies is few. A couple of decades ago I happened to find that first U.S. press LP at Aaron’s Records on Highland Avenue in Los Angeles. It was in the $1 bin and was a little dusty. After I cleaned it, I found almost no scratches on it. At the time, I wasn’t aware how valuable it would become. But now it is our family treasure. The sound of this copy is not the same as any other versions, including the one re-released in June this year. This may not matter to casual listeners, and yet to me, as a dedicated life-long fan, it means a whole lot. Ochazuke is a staff-written column. Opinions expressed are not necessarily those of The Rafu Shimpo. 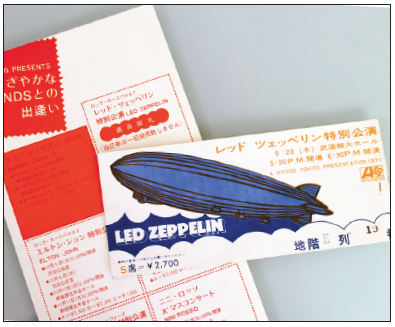 Led Zeppelin’s concert ticket from Sept. 23, 1971 in Tokyo and a flyer distributed at the concert. It reads, “Led Zeppelin, sold-out concert” and also announces Elton John’s concerts in October.